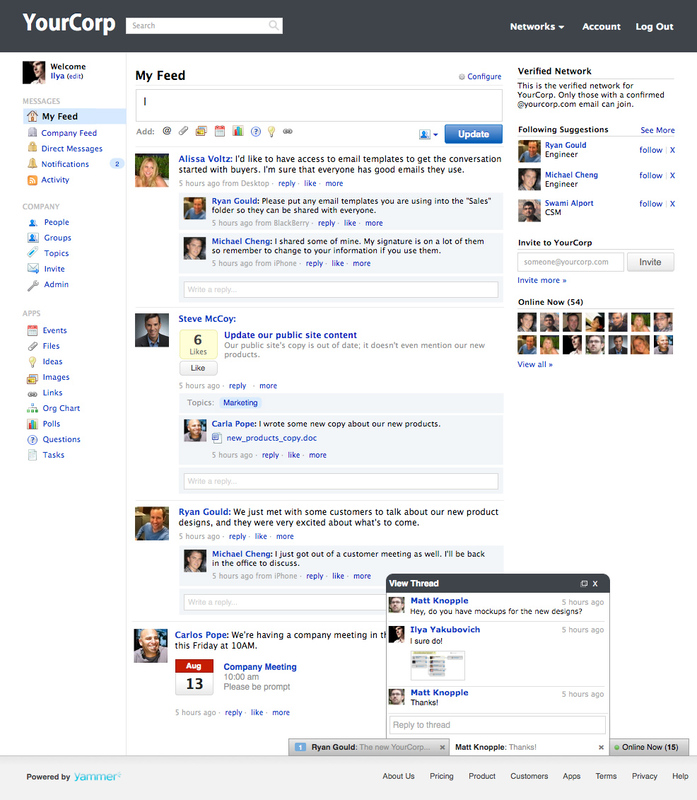 Yammer will relaunch next week in order to formalize itself as an enterprise social networking site. Where once the company could be described as Twitter for the enterprise, now it will be Facebook for the enterprise — to the point that you might do a double take when you see the new design. It’s so eerily similar to Facebook, I’d worry that I might get confused about whether I’m among my friends rather than my coworkers. So I was interested to learn whether Yammer is returning the favor and innovating and contributing technology and features that might have value for other social networks. 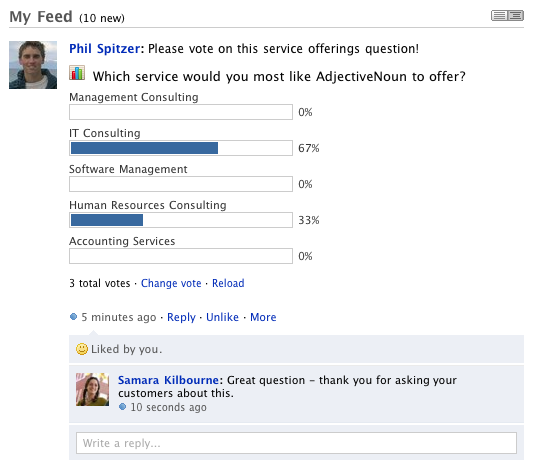 Most interesting, Yammer has come up with the idea of a dynamic object that changes state in its feed. Yammer is opening up this platform to other companies who want to develop on it and create dynamic objects in the activity stream themselves. Yammer, which has raised $15 million in funding, has 80,000 networks and more than 1 million users, with more than 15 percent of them paying customers. Though it has mobile and desktop apps, usage is primarily through the web version. Isn’t the news that they’re opening up the platform for developers to create objects in the stream pretty big too? I’d like to hear more about that. Yes, definitely. David said this will be a “more lightweight integration” — they are not looking for other people’s dedicated apps to live on their platform. But anything that can help displace email, IM, etc by placing an object in the stream, they want to do. Nice writeup Liz! Yammer it seems to have been stuck in the same basic “Twitter for Business” approach, and I would have said that was working for them with the impressive numbers that always get thrown out there with the number of networks etc, but it seems like they are realizing that collaboration without purpose gets you about as far as using Twitter or email alone. Anyone with an email address can sign up for an absolutely FREE MangoTalk domain and see the difference for themselves, TODAY. It’s already out and ready to use, no waiting required! http://www.mangospring.com to sign up.